Blackheads...nobody wants them but everybody has them. They can be super annoying and hard to get rid of but with our tips and tricks, you'll clear up those spots and prevent future ones. So to clear up these clogged pores, you want a product that will exfoliate away dead skin cells and go deep down into pores to clear up buildup. 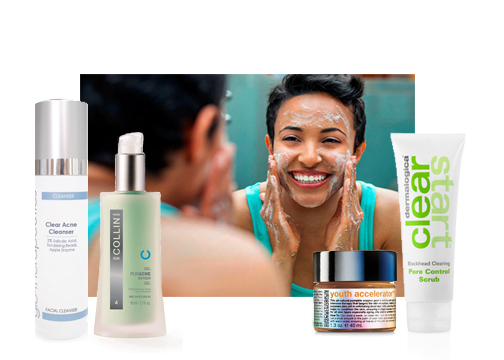 When choosing a product, look for something with chemical exfoliants like Salicylic or Lactic Acid, or physical exfoliants like microbeads. Don't pick at your blackheads! This can damage your skin and allow more bacteria into your pores. Cleanser: With 2% Salicylic Acid and gentle scrubbing beads, gloTherapeutics Clear Acne Cleanser clears skin's surface and deeply penetrates pores. Scrub: Using natural bentonite clay and beneficial microbeads, Dermalogica Clear Start Blackhead Clearing Pore Control Scrub rids skin of excess oil and buildup. This process allows for the ingredients to also clear out your pores and blackheads. Peel: If you're looking to target aging, clogged pores and blackheads, try a peel like Sircuit Skin Youth Accelerator+ Pumpkin Enzyme Peel. Its natural enzymes get rid of dead skin cells, while Lactic Acid and Pumpkin exfoliate and deep clean your pores. Treatment Gel: Also utilizing 2% Salicylic Acid, G.M. Collin Puracne Oxygen Treating Gel can be used all over the face or as a spot treatment. It purifies skin to help control existing acne and blackheads, and prevent future breakouts. When using a product with potent or skin scrubbing ingredients, it's important to follow the product's directions. Overuse can further irritate your skin or cause sensitivity issues. Also, since you have scrubbed away dead skin cells on the surface, it's essential that you protect your skin with a sunscreen everyday! Look for oil-free formulas like EltaMD UV Clear Broad-Spectrum SPF 46 to keep skin clear. What skin issues are you struggling with? We'd love to help!